The internet has become a more open place to everyone. Anyone can share their skills, knowledge and ideas through various mediums such as Videos, podcast and obviously through blogging. When it comes to blogging, you can start a free blog right NOW with BlogSpot blogging platform. Blogspot or Google Blogger is one of most popular blogging platforms in the world. If you want to learn step by step how to create a free BlogSpot blog, read this detailed post that will guide you on how to create a free blog and start optimizing it for real world. Today, in this tutorial you will learn how to host Blogger on your own domain. In other words, set up the custom domain for Blogspot blogs. If you’re wondering why you should use a custom domain for your BlogSpot blog, Here are a few reasons. Custom Domain Blogger gives your blog the uniqueness and the professional look. Increases the credibility and authority of your blog. Thus, many people prefer to click on your domain on SERP than another.blogspot.com blog. Blogspot custom domain increases your brand exponentially. Take your Blogspot blog as another authoritative online business to the world. People like to share links with a custom domain than a blogspot.com domain. So you get more social exposure and eventually obtain more natural backlinks, co-citations and traffic. Now you’re convinced that you should take a decision to have own domain name for your blog rather than usual yourblogname.blogspot.com. So, let’s start adding a custom domain name for your BlogSpot blog. Are you ready to start adding a custom domain name for your BlogSpot blog? So, let’s start! Actually, this is a crucial part of this tutorial. If you purchased a non-relevant domain for your blog, that could decrease your credibility, traffic and even waste your valuable time and efforts. Choosing a domain name for your blog is easy. But here are a few tips to select a perfect top level domain (TLD) for your blog. Make sure you chose one of these three domain types as your need. Select an easy to spell, enter and short domain name such as moz.com and labnol.org. Find whether anyone has already claimed your brand on social networks such as Twitter, Facebook etc. You have to start from A. So make sure you can commit your time and efforts for your blog. Try to include at least one of target keywords within your custom domain. Ex: premiumbloggertemplates.com, bloggingtips.com (Your target keyword would help in boosting rank for multiple long tail keywords, even though they are very competitive) you can find awesome keywords using the Google keyword planner. Make sure your domain name doesn’t exceed the 10-15 characters. It should be easy to spell and also be memorable. It doesn’t matter how much lengthy the domain name is. But, don’t add extra words for top level domain. You can find good top level domain names for your niche/event blogs by using LongTail Pro niche software. Get a Long Tail Pro discount over here and learn more about Long Tail Pro through this comprehensive Long Tail Pro review. Now I think you have an idea what type of your BlogSpot custom domain should be. If you want to start a blog for your online business, you can use a short but very descriptive domain such as Social Media Examiner and Pro Blog Tricks. Now it’s time to find the domain name availability. Use one of these free tools to check domain name availability. Don’t worry if your intended domain name for BlogSpot is not available. Be creative and craft a good top level domain name. Once you have your own domain for BlogSpot blog, it’s time to register the domain name. In the real world, .com, .net and.org top level domains perform well on search engine result pages (SERPs). So if you want to buy a .com domain or even other top level domain, you’d use a top domain name register such as Godaddy. Godaddy is the best domain name registrar in the world. Already millions of webmasters use Godaddy to purchase their domains. If you want to buy a cheap domain for your Blogger blog, Use Godaddy domain registrar. Special Coupon: Purchase your special .com domain with a HUGE discount over here. After purchasing your custom domain for Blogger blog, follow below instructions to integrate custom domain with BlogSpot. #1. Login to your Blogger account from www.blogger.com. Choose the blog you want to set up the custom domain from blog list. #2. Go to Settings >> Basic and then click the “+ Set up a 3rd Party URL for your blog” link under your blog address. #4. Click on “Save” button. You should get a red error message. Don’t worry, it’s normal and we want this! If you don’t get this error message, follow these steps to get the token key for your Blogger custom domain. #4. 02 Click on “Verification Details” link right of your custom URL. #4. 03 At the top of page you can see how you attempted to verify your domain. Click on DNS CNAME record details to expand the record. #4. 04 Now you would get a similar result like below. The portion of highlighted area is the “Host” part and the portion begins with “gv” is the “Point to” field. Save these details in a text document. You need them later in this tutorial. Now you got the CNAME domain verification token key from Blogger. Let’s move to next step: mapping domain to work with Blogger. #5. Log in to your Godaddy account manager. #6. Click on “Launch” button next to Domains. #7. Now you can see all your registered domains. Select the domain you want to add to Blogger and then click on the down-arrow button. Choose Manage DNS option from the menu list. #8. You are in the Domain DNS zone. This is where you control the domain name, adding subdomains, linking to website hosts, etc. Now you want to verify your authority of domain name to Google. Click on “Add Record” link in the Zone file section. #9. Now you can see a pop out box titled “Add Zone Record”. Select record type as CNAME (Alias). Enter the values in the Host field and in the Point to field as shown below screenshot. Note: You should copy and paste the values you received from Blogger in the 4th step. Don’t enter these values. #10. Set TTL (Time To Live) as 1 hour. Then click on “Add Another” button. If you added the values correctly, you’d see a screen like below. #11. Now you can close the pop up window. Don’t forget to save your changes. #12. Now you have to point Google host to add www subdomain to your blog. Follow this step if you want include www in your domain. (Ex: www.priyadarshana.com) People who enter your blog URL as www.yourblogsite.com and try to view your blog will see a 404 page, if you don’t add www domain. So here’s how to add www part to your domain in Godaddy. By default, Godaddy adds www subdomain pointing to the same host. So you just need to edit the Point to address. Here’s how to do it. Click on Edit Record icon of www CNAME. Remove “@” in the Point to field and enter ghs.google.com. Set TLL as 1 hour and click on finish button. #13. Now you verified your domain. But you didn’t point your domain to Google IPs. Here’s how to change the host IPs and set BlogSpot as the hosting provider in Godaddy. #13. 01 Click on “Add Record” link. #13.02 Select A (Host) Record from the record type list. Type @ to Host text field and in the Point to, enter this first Google IP: 216.239.32.21. Set TTL as one hour and then click on “Finish” button. Now do the same thing for these three Google IPs and last save your changes in Godaddy Domain DNS zone. After entering above four Google IPs, you’d see a screen like below. #14. You don’t need the original host IP anymore. So you can delete it. Now you configured custom domain at Godaddy for your BlogSpot blog. Remember it might take up to 48 hours to update the DNS zone. So wait a few hours and come back to your Blogger account. For me, It took less than 5 minutes to map the custom domain to Blogger blog. If you followed the same process I explained above, you would also be able to set up the custom domain in less than 5 minutes. Click on “Edit” link near to your custom domain in Blogger account and select the option that says to redirect your non-www domain to www domain. Question: I have a fear, whether my search engine ranks will be dropped by moving to a custom domain. Can I get my lost positions again? Blogger uses permanently redirect method which is also known as “301 redirect”. So 90% of link juice and authority will pass to your new domain. However, it’s not guaranteed that your previous search positions will come again in an overnight as you have a new domain. It’s good to move to a custom domain as fast as you can. But, If you’ve already verified your website on Google Search Console, you can tell Google that your blog address is changed. Step #1: Move to Google Search Console (Google Webmaster Tools) over here and look for your Blogger blog. Step #2: Now click on Gear icon in the top-right corner of screen and select on “Change of Address” option. It will redirect you to a new page. Step #3: Click on “add it now” link to add the new blog address to Google Search Console. Step #4: Click on “Add a Property” button and type your new custom website address. Step #5: Now you can follow any of verification methods to verify your new domain. After you do that, Google will recognize that old BlogSpot blog has changed its name. So, after a few days, all BlogSpot URLs will be changed to the new custom domain in Google search results. Question: Should I change my blog posts and page permalinks within blog posts? No, Blogger uses permanent redirect to redirect the traffic to new domain. It will also redirect traffic coming from old URLs. 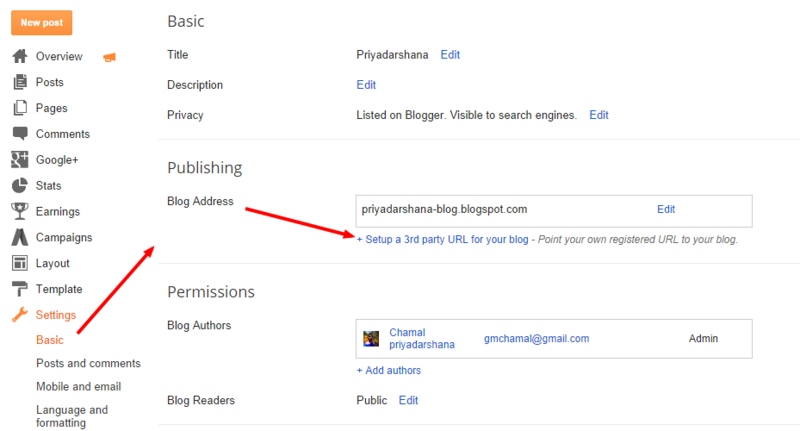 Go back to Blogger Publishing section and click the edit link near to your blog custom URL. Check the check box which asks you to redirect traffic from non-www URL to www URL. Now you set up the custom domain for your BlogSpot blog. So Here are some important things to do for increasing the SEO performance of your blog. Submit your website to Search Engine: By submitting your website to search engines, Search engine bots will start crawling your website. So people can find your new domain on SERPs quickly. Submit New sitemap to Google webmaster tools: As you add custom domain to your BlogSpot blog, you need to submit a new sitemap to Google webmaster tools. Follow the steps in this blog post to learn how to submit a new sitemap to GWT. Add your domain to Bing and Yahoo: Bing and Yahoo are two search engines which can drive quality traffic to your website. Read this post and learn how to add your blog to Bing and Yahoo search engines. Setup Google Analytics for Blogger: If you didn’t set up Google Analytics for your blog, follow the steps in this post to track visitor and user activities of your blog. If you already have set up Google Analytics for your blog, edit the website address in Google Analytics account. So you can get more accurate reports. Submit your website to Baidu and Yandex search engines: Although they are regional search engines, they can drive massive traffic than some social networks. Do you know that Baidu is one of the top 10 most popular websites in the world? So go ahead and follow the steps in these two blog posts to optimize your BlogSpot blog for Baidu and Yandex search engines. Meanwhile, you would follow these practical tips to increase your brand new domain’s Alexa rank quickly. Using a top level domain name for your BlogSpot blog not only gives the unique and professional look, but also after a few weeks, you could start seeing massive increases of your overall traffic stats. It’s not only because you publish engaging content that people want to read and share with their friends, but also because you have built up the authority and expertise in your industry that people remember you as the owner of yourdomain.com website. People will start addressing your Brand on social media, online communities, online-conferences and also search your brand/website on Google. That way without your concern, your custom domain will be popular in day by day. Don’t forget that quality and helpful content always matter. Take a note of every cool blog post idea on a paper. Listen to other voices to understand what works and what are popular topics in your niche. If i am you, i also very concerned about my English grammar. I use these tools to correct my punctuation mistakes and follow this method to find and correct English grammar errors online fast. Hope this tutorial helped you set up the custom domain name for your BlogSpot blog. If you have anything to ask, share or complain, please use below comment form. So, What do you feel about your custom domain name? i have searched alot and follow every tutorial including yours too, to set up my godaddy domain with blogger. but i dont know whats wrong with me… my website not opening if connect its redirecting again and again. my blog is http://apratimblog.blogspot.com is set to domain http://www.apratimblog.com both are not working. you can check the problem. Awesome post sir, you made it really easy to understand this topic. Now we can Disable facebook ‘seen by’ message, Which is really pretty cool and helpfull. Awesome post, you made it really easy to understand this pretty hard topic for biggners. You helped me alot so I just wanna say thank to you. Great. Follow others tips as well to optimize your blog for search engines.